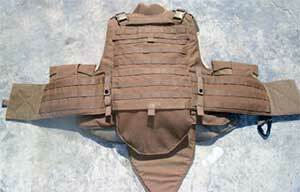 The following content is provided by the USMC (US Marine Core), and details proper assembly and usage of modular tactical vest that includes integrations of body armor. It goes over inspection, assembly, do's and don'ts, and tips on how to make sure you are setup correctly. We have rewritten the guide to assist non-military civilians. 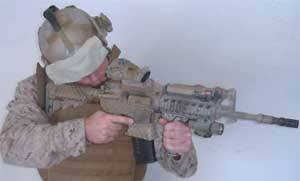 You should be able to find these at military surplus stores, there are hundreds for sale on eBay. Modular simply means it comes it comes in modules or sections. The primary chest rig will allow you to add and subtract things like magazine pouches, cleaning kits, radios, and even something like a small first aid or trauma kit. The Marines (MTV) or modular tactical vest's purpose is to provide maximum protection and weight distribution of armor plates, while at the same time allowing it's personnel better range of motion, and the ability to quickly customize the "chest rig" area. Inspect Front and Rear Carrier for rips and tears. Ensure plate pockets are not sewn down. Inspect all soft armor components for tears or stains associated with exposure to petroleum products. Inspect Cummerbund assemblies and ensure that the white Dacron loops are not frayed or the side plate pockets are not sewn shut. I. Front and Rear Carrier Assembly. For Original PDF with more details click here. To order a USMC Pack Instruction Card click here. If you are looking to relive your glory days, or just have some fun running and gunning a surplus modular tactival vest might be worth purchasing.